Team Rocket is still reeling from its crushing defeat in Saffron City, which gives you a chance to resume your original quest: to become the greatest Pokémon trainer ever. You can start by visiting the Safari Zone here in Fuchsia City. The Safari Zone is home to many Pokémon species that aren't found elsewhere, so keep coming back until you've caught the rare ones! Fuchsia City is a quiet place, famous only for the Safari Zone and Koga's Gym. The Safari Zone is an amusement park for Pokémon trainers. You are given special Safari Balls and Pokémon bait and are allowed to captured as many rare Pokémon as you can within 500 paces. The Fishing Guru's older brother runs a fish farm here in the city. Speak to him to get the Good Rod, although that's pointless if you took Route #12 and already got the Super Rod, which lets you fish for higher-level Pokémon. Drop a line in the pond behind the man's house in the bottom-right corner and see what turns up. Next door is the Safari Zone Warden. The Warden has lost his teeth, and no one can understand a word he's saying. His choppers are probably in the Safari Zone somewhere. Find them and return them to the Warden, and he'll reward you handsomely. He will give you HM 04, which you can use to teach a Pokémon the Strength ability to move large objects, which you can try on a nearby rock to get a Rare Candy. The Safari Zone may be the most popular tourist attraction in town, but the real trainers eventually make their way to the Gym for a true test. The Fuchsia City Gym is the headquarters of Pokémon trainers who also follow ninja disciplines. Their training regimen focuses on techniques that Poison and induce Sleep, so be sure to have some Antidotes and Awakenings on hand. You can also use your Pokéflute instead of awakenings. 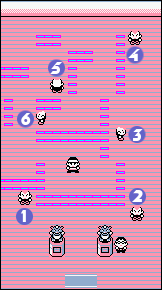 Koga is protected by a maze of invisible walls and a troop of six ninja-style trainers. The invisible walls in Koga's Gym are annoying, but their locations have been made more obvious for you in the map below. Koga is a snap compared to the difficulty in reaching him. In general, if you stick to the right wall and walk all the way around the outer wall as best as you can, you'll get there eventually. A lot of trainers here are packing Psychic Pokémon, so bring a Bug-type (Parasect is good) or strong, speedy fighters to finish them quickly. The ninja master himself will send out two Koffing, a Muk, and a Weezing in the Red and Blue version, and challengers with the Yellow version will find themselves face-to-face with three high-level Venonat and a Venomoth. Poison Pokémon are good here, since they can't be affected by Poison themselves. Ground is always strong against Poison, and Psychic is great. Players in Yellow should also use Flying and Fire against their Bug-type opponents. If you defeat the poisonous lot of Koga's Pokémon, victory earns you the Soul Badge and TM 06, containing Toxic, the one useful Poison skill. The Soul Badge boosts the Defense rating of all your Pokémon. This page was last edited on 18 November 2018, at 18:36. This page has been accessed 779,008 times.